Date and Fabric: c. 1901: two and a half storey brick. 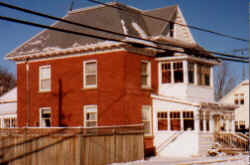 The current  United Church manse was built c. 1901. It was then the new Methodist parsonage, replacing the Church Street parsonage at 2352 Church Street q.v. In 1925 it became the United Church manse when the Methodists and some of the Presbyterians amalgamated. Church meetings were often held inside the manse and in this way it became familiar to many congregation members. With regard to structural changes, Mr. Harry Seabrook speculated that the present front porch replaced a verandah in the early 1940's and that the deck was added to the roof about 1975 75. The house has two kitchens. * Supply clergy who didn't actually live in the manse. 75 Mr Seabrook was mostly, but not entirely right. An undated but early photograph on the file shows a ground floor open verandah extending across the front of the house; this was obviously converted later to a narrower closed exterior vestibule. However, the "deck", if this means the second storey porch, appears on the earlier photograph, although it was not closed in at that time.